In large bowl, shred the crustless bread until you have small fluffy pieces. Add garlic, cheese, parsley, salt and pepper. Toss bread and seasoning mixture together until combined, then add oil. Toss mixture together again and set aside. Taking each artichoke, cut off the stem, trim the tips, then run under cold water. Turn and shake each artichokes upside down to drain water. Spread artichokes open and divide bread mixture between them. Be sure to put some between the outer leaves. Place the trivet inside of the Instant Pot™ and add 1½ cups water. Arrange the artichokes so that the leaf ends are up and then secure the lid. Select “Pressure Cook” setting - high - no delay - keep warm OFF - 15 minutes. When the timer goes off, let the pressure come down naturally for 10 minutes, and then quick release the remaining pressure. 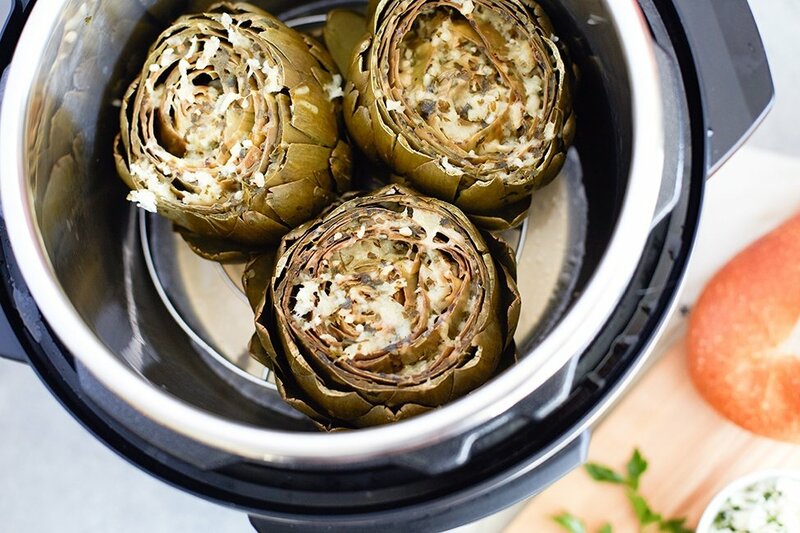 Test the artichokes for doneness by removing a leaf and scraping the tender bottom with your teeth. If needed, replace lid and cook again for 1-3 minutes, then quick release the pressure.